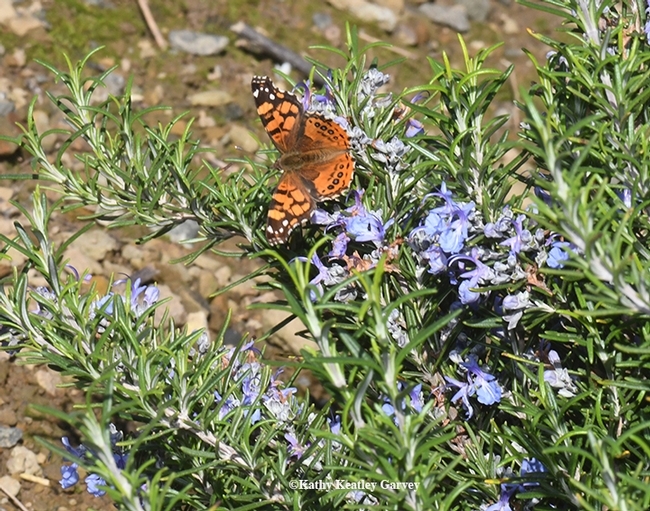 There she was--a gorgeous orange-and-black butterfly sipping nectar from a rosemary bush near the Glen Cove Marina, Vallejo. She seemed so out of place and out of season. It was Sunday morning, Feb. 11, and we were east of the Carquinez Bridge, with the temperature pushing 70 degrees after a raucous winter storm. The butterfly? A West Coast Lady, Vanessa annabella (as identified by Art Shapiro, UC Davis distinguished professor of evolution and ecology. 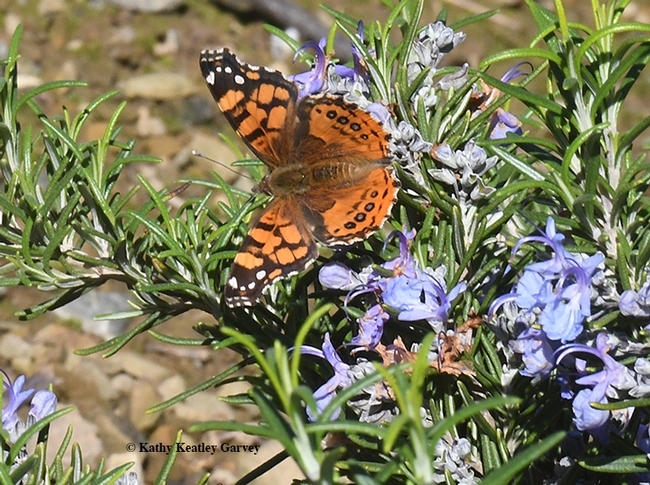 It's often confused with Vanessa cardui, commonly known as "Painted Lady." "Adults 'hibernate,' but near sea level can be seen sunbathing and being territorial on sunny, mild days all winter long," he writes on his website. "There is probably some altitudinal migration, but no evidence of latitudinal migration as in V. cardui." "Host plants are herbaceous Mallows, including Cheeseweed (Malva), Alkali Mallow (Malvella), and Hollyhock (Alcea); not recorded locally on Velvet Leaf (Abutilon theophrasti). The species also uses Urticaceae. Several broods, the entire season at any given location." Shapiro describes the West Coast Lady as "an earnest and generalist flower visitor. In winter often seen on flowers of Rosemary, Escallonia (an evergreen shrub or hedge) and Salpichroa (nightshade family) in gardens." Our West Coast Lady soaked up a little sunshine and a little nectar and off she fluttered. What Color Is Your Pollen? The next time you see a yellow-faced bumble bee (Bombus vosnesenskii) packing pollen, check out the color. Last Saturday on an outing in Vallejo overlooking the Carquinez Straits, we noticed a yellow-faced bumble bee on an Echium candicans (Pride of Madeira) packing red pollen, as brilliant as a sun-ripened strawberry. It probably picked up the red pollen from the nearby California golden poppies--not from the Echium because Echium pollen is a bluish/lavender. The yellow-faced bumblebee, so called because of its yellow face, is native to the west coast of North America. In the global line-up, it's one of some 250 species of bumble bees--all within the genera Bombus, which is Latin for buzzing or humming. Bombus vosnesenkii is easily identifiable by its yellow face and the yellow stripe or band at the T4 segment of its thorax. 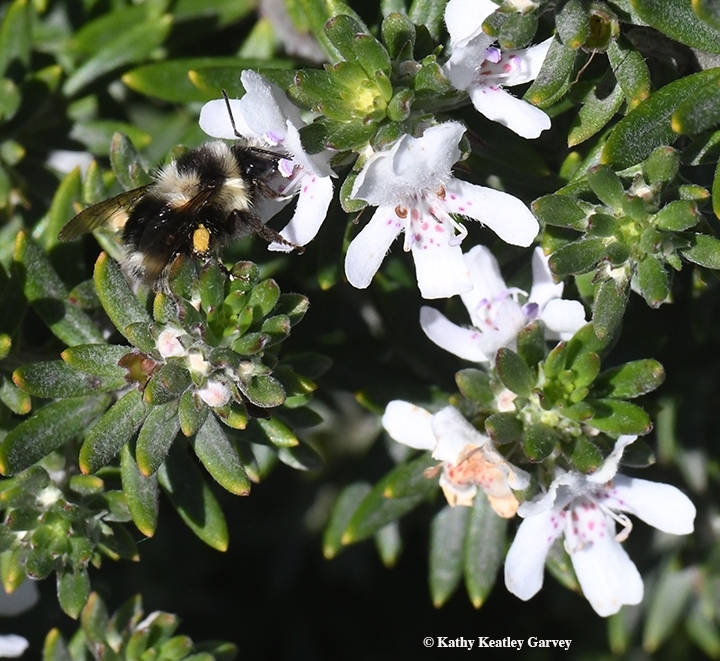 Want to learn more about bumble bees and how to identify them? Robbin Thorp, distinguished emeritus professor of entomology at the University of California, Davis, co-authored the landmark publication, Bumble Bees of North America: an Identification Guide (Princeton University Press) with Paul Williams, Leif Richardson and Sheila Colla. It won a 2015 Outstanding Reference Sources Award from the Reference and User Services Association, American Library Association. 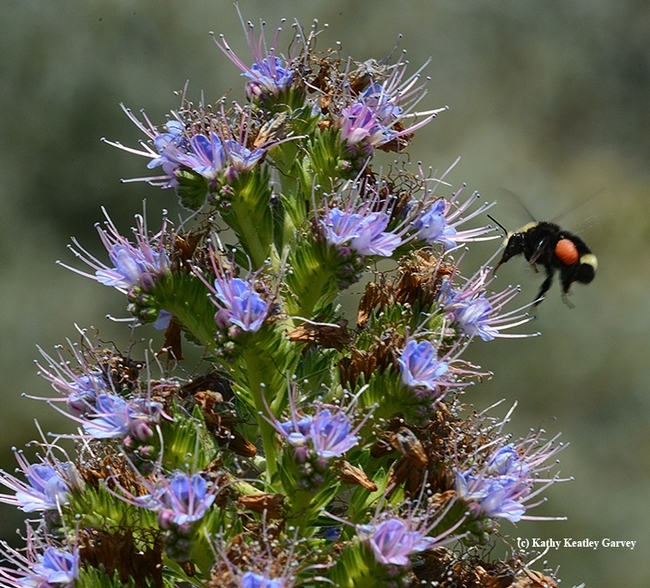 There's increasing interest in bumble bees--and rightfully so--due to the critical role they play in our ecosystems. 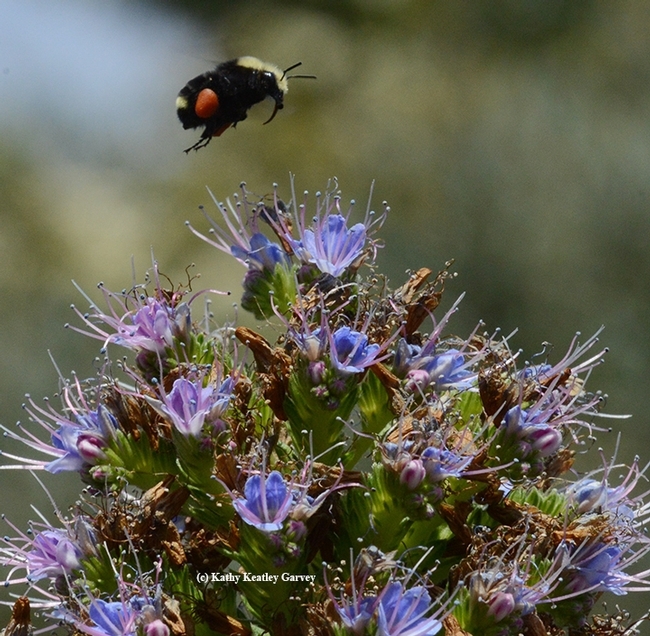 Bumble Bees of North America is described as "the first comprehensive guide to North American bumble bees to be published in more than a century." 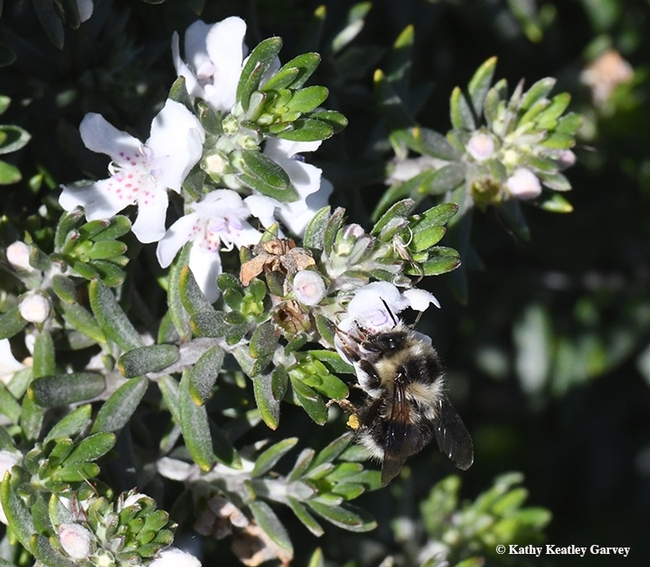 We haven't seen many bumble bees this year, but as spring temperatures warm up and blossoms beckon, they'll be out there foraging. Graced with many colors of pollen.